With a 50% larger cabin environment than most ‘very light jets,’ the King Air 90 is a more comfortable alternative for short-hop excursions than its turbofan counterparts. Due to the aircraft’s square-oval cabin design, passengers enjoy ample head and shoulder space, without having to scrunch down. The twin-engine King Air 90 is one of the most dependable charter planes available. Older models are capable of cruising at speeds of nearly 300 mph, making it an attractive option for short to medium distances. Its low operating costs and spacious cabin make it a solid choice for corporate travellers looking for an aircraft capable of flying one-to-two hours nonstop. 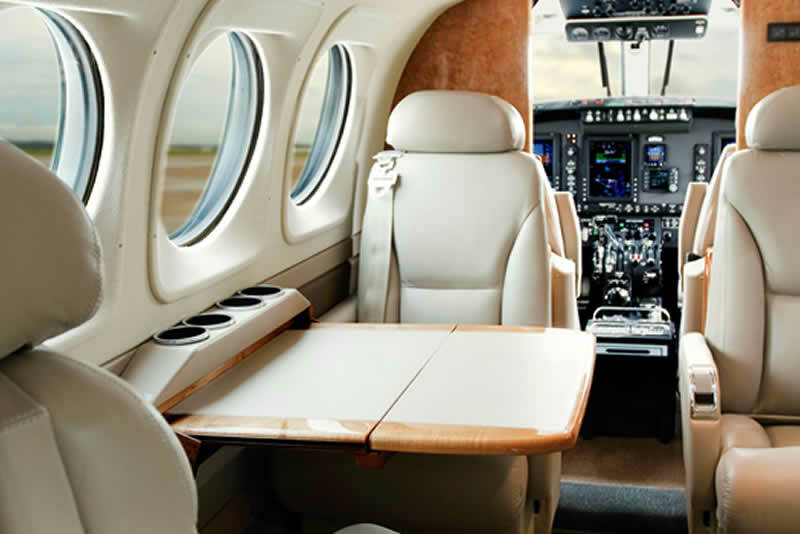 Unlike the new generation of very light jets currently being introduced to the charter market, the King Air 90 has a spacious cabin layout that can carry six adult passengers with all their luggage. With an impressive range of 1,329 nautical miles, this turboprop enables executives and leisure travelers to comfortably for up to 5.5 Hours without stopping.